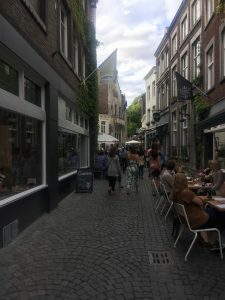 I haven’t done a non-reading post in a while and I thought I would switch it up with some posts about Maastricht. I got back a week ago from a short vacation there with a few of my friends from Delft. We rented a house via Airbnb near the Sint-Pietersberg. It was a 20-minute walk to the city center which was very doable. We did not do much, but we did enough for me to share some experiences in some separate blogposts! 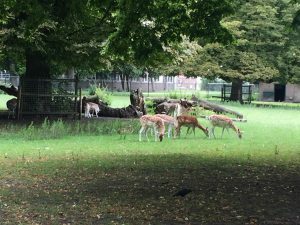 To walk to the city center we would pass this lovely deer enclosure every day. 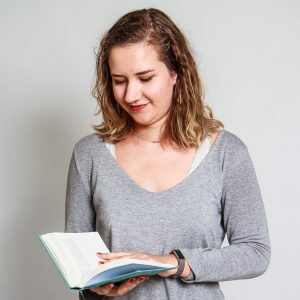 It is located near the ‘Tapijnkazerne’ which were actually converted military barracks with a lovely cafe, some workstations and a place for people to sell their handcrafted items. The city center itself felt to me like Delft on steroids. A village look, but an urban vibe (could it be any more obvious I come from a big concrete city?). I really liked it. There were small cafes and terraces everywhere. Some streets were full with chain stores. However, if you wanted to avoid those, there were plenty of streets left to explore. 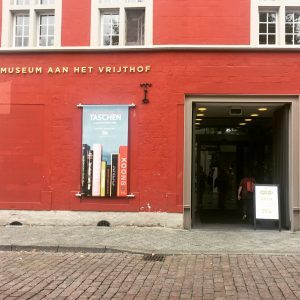 There are multiple musea in Maastricht, but we ended up only visiting ‘Museum aan het Vrijthof’ which is, as the name suggests, located at the Vrijthof in the city center. 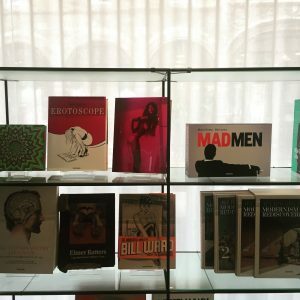 It had an exposition of Taschen books and we were intrigued. It was really hard not to pick up any of the books and start flicking through them. But thankfully there were also a lot of books you could pick up. At the end of the exhibition, there was even a big reading room with a lot of copies to peruse. The information on Taschen itself was sparse and the time line they set up was a bit confusing to read. It was still nice to see the collection of extraordinary books. I am a sucker for rivers in cities and Maastricht has some lovely bike/pedestrian bridges. 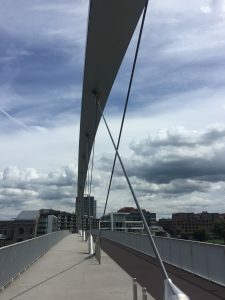 Overall, I really enjoyed the city and you can expect a separate post on the book shops I visited, a beer tasting excursion and a nature walk we did. Let me know if you’ve ever been to Maastricht and any place I should go next time in the comments below!